Steven Hauschka (9), shown lining up to attempt a field goal in the Locomotives' 22-10 victory over Omaha on Oct. 8, has converted 7 of 8 field-goal tries for Las Vegas and drawn praise for his deep kickoffs. The Locomotives might not know if they have a quarterback, but they finally have a kicker. While the jury is out on backup quarterback Drew Willy, who replaces the injured Tim Rattay on Saturday when the first-place Locos host Hartford at Sam Boyd Stadium, Steven Hauschka not only has given Las Vegas a dependable field-goal kicker, the 3-1 Locos also have someone who consistently can launch kickoffs into the opposing team's end zone. "I had been waiting for an NFL team to call, and it took a lot of thought to do it," Hauschka said of playing in the United Football League after stints the past two years with several NFL teams, including Minnesota, Baltimore, Atlanta and Detroit. "Sometimes, you don't know if it was the right decision. But so far, it's worked out." In two games, Hauschka is 7 of 8 on his field-goal tries, including a long of 49 yards. He kicked four field goals in the Locos' 26-3 win over Sacramento last week and was selected as the UFL's Special Teams Player of the Week. "Obviously, you want to make all your kicks," said Hauschka, who was signed Oct. 4. "But to get off to a good start and help the team win has helped my confidence." Coach Jim Fassel knew one of his offseason tasks was replacing Graham Gano, who had signed with the Washington Redskins after the Locos won the inaugural UFL championship in November. He thought he had filled the void with Brooks Rossman, but Rossman hurt his leg late in training camp, forcing Fassel to sign Parker Douglass, who had played in the UFL last year with California (now Sacramento). But Douglass was erratic with his field goals, and his kickoffs weren't going deep enough. He was released after Las Vegas' 1-1 start, and Hauschka, who had played soccer at Middlebury College in Vermont before becoming a place-kicker and played one year at North Carolina State, got the call. "We always keep a list of players at every position in case we get in trouble," Fassel said. "We researched a few guys, and I really liked (Hauschka's) demeanor. He's calm and confident. 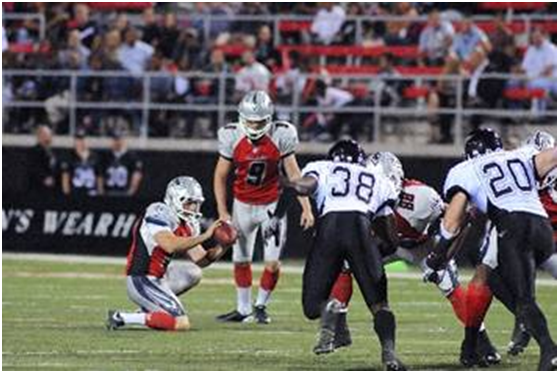 Kickers don't have to learn a system; they just have to kick. He's come into a pressure situation and done a real nice job for us." And while Hauschka is putting points on the board, his kickoffs have been just as vital. In the Locos' first two games, the average starting field position for their opponents was the 27-yard line with no touchbacks in eight attempts. With Hauschka, teams are starting drives at their 22. In 13 kickoffs by Hauschka, only one has been returned beyond the 30, and there have been five touchbacks. "The depth of our kickoffs early this season bothered me," Fassel said. "We don't have that concern anymore." Hauschka said he has concentrated on driving the ball deep. "I think I have a strong leg, but I've been focusing on hitting my kickoffs right on my foot and hitting it square," he said. "The difference between starting at the 20 or at the 35 is huge." Hauschka said he hopes to follow in Gano's footsteps and get picked up by an NFL team in late November. "I think if I can keep kicking well, I can get back" to the NFL, he said.